Deer tendons are sold here as Dried, preserved. This is how it looks like after its cut. I have ask the shop to cut into 3 parts for me. 1. 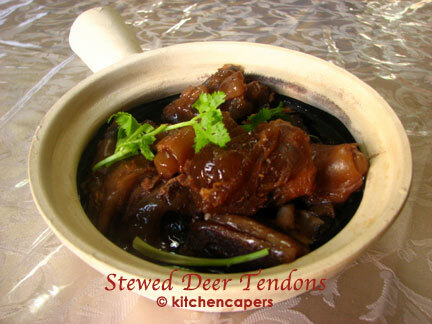 Pour water into a slow cooker and add deer tendons, cloves, cinnamon stick to cook over LOW HEAT for 8 hours. 2. It should be tender now..Add the remaining ingredients to cook for a further 2 hours. 3. Serve in a claypot with sauce. Only to soak overnight if you didn't get it cut. The whole tendon is like a long long stick! Once its a bit softer after soaking overnight, then use a cleaver and cut it. If you soak it overnight, you can reduce the cooking to 6 hours. It looks very appetising after it is cooked ;p How is the taste like? can't tell its deer. Similar in taste with Beef. Only that Beef tendon is more soft and gooey. 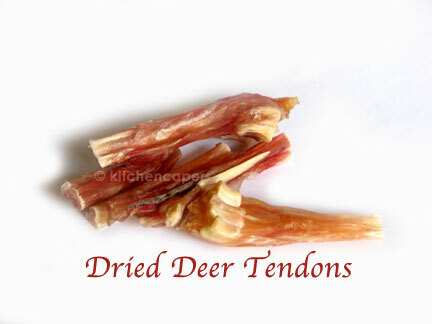 Deer tendon is more firm. one thing though, the smell is very strong. A bit like deer smell(skin). So you may want to add Sichuan peppercorns or black peppercorns to mellow the smell. Wah... got such things. Haven't seen before. Is it expensive? Gina, can the same recipe be used to cook beef tendons? Beef tendons yes..but I have already loaded the recipe here..not in Thermal cooking, at Asian red meats.